Originally featured in Omaha World-Herald on February 15, 2014. In the 1950s, Omaha won a satirical contest for having one of the worst libraries in the nation, but to Omaha residents, this denotation was no laughing matter. 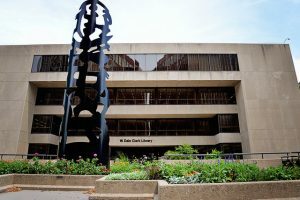 For years, there had been efforts to construct a new main library, one that would replace the building on 19th and Harney Streets that had served as the main library since 1893. While the architecture of the building was undeniably beautiful, it was determined inadequate to meet the city’s growing population and the need for more modern resources. By the early 1970s, the demand for a new building could no longer be ignored. The mayor and City Council agreed that planning could begin and allocated funds to begin the process in 1973. The square block bounded by Douglas and Farnam, and 14th and 15th Streets was selected for the site of the new building. Major contributions from the Omaha World-Herald Foundation, the First National Bank of Omaha and the United States National Bank helped make the new library a reality, along with contributions from Omaha Public Library board President Milton R. Abrahams, Mrs. W. Dale Clark and anonymous donors. The library was named for W. Dale Clark, a longtime banker, civic leader and World-Herald board member. During his tenure on the World-Herald board, a New York newspaper magnate offered to purchase the paper. Clark ultimately helped acquire a higher bid from Peter Kiewit and guided the sale to keep the paper locally owned. W. Dale Clark Library opened its doors to the public in March 1977. Patronage of the new building breathed new life into downtown, and one newspaper columnist declared the opening of the new library to be “the greatest event in Omaha’s history.” The library housed the city’s largest collection of books, framed artwork, and even a toy library that loaned toys in the same manner as checking out a book. Today, the library offers the largest genealogy department between Chicago and Salt Lake City. It also receives national attention for some of its more unusual items, including photos and artifacts from the 1898 Trans-Mississippi Exposition, cuneiform tablets and a human scalp.